Edmund Rothers sat in the shadows at the back of the saloon. His eyes flicked down to his cards. A pair of aces, a pair of eights, and a queen. The Dead Man’s Hand. Edmund looked up at his opponent. “You sure don’t say much,” said Blackjack Bud Hudson across the table. “I apologise for my reticence, it is simply the way such games are played in the gentlemen’s clubs of London. Is conversation the accepted convention in these parts?” asked Edmund. Blackjack Bud narrowed his bloodshot eyes. He twisted his thin lips into a sneer. “Of course not. It would be most unbecoming of me to insult my host in such a genial and hospitable place as this,” said Edmund. He gestured around the half-empty saloon. His eyes lingered on the buckshot embedded in the walls, testament to an old grudge turned violent. “I assure you it is not my intention. As it happens, I consider you a natural raconteur and easy wit. Come now, this talk distracts us from our game,” replied Edmund. Blackjack Bud grunted and looked back at his cards. Edmund suspected a bad hand from the way Bud squinted and frowned at the cards. “Very well,” replied Edmund. He spread his cards on the table. Blackjack Bud’s face contorted in rage, his eyes bulging as a vein in his temple throbbed. 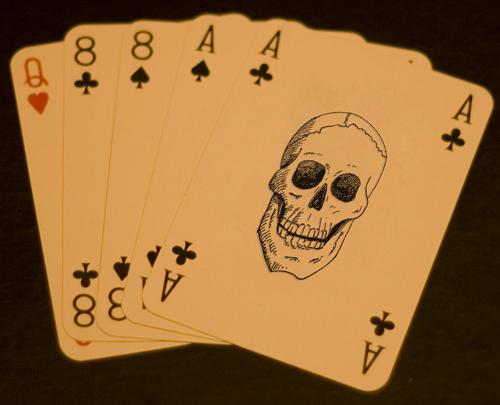 He threw down his own cards – a pair of threes, a six, a nine and a King. “Oh that is bad luck, Mr Hudson,” said Edmund. He reached across the table for his winnings. Blackjack Bud slammed his fist down, trapping Edmund’s hand on top of the crumpled bank notes. He leaned across the table. The stale alcohol on his breath made Edmund’s eyes water. Blackjack Bud’s free hand trembled beside his holster. Edmund jerked his own free hand to his shin. His hand grasped the smooth ivory handle of the knife hidden beneath his trouser leg. He unsheathed the blade and slashed across Blackjack Bud’s face in one fluid motion. Hudson howled, yanking back his fist and pressing both hands to his cheek. Blood welled up between his fingers and dripped onto the table. A drop splashed the King of Hearts. Edmund grabbed a fistful of money and bolted. The other patrons of the saloon watched him vault over a table and burst out of the swing doors into the street. 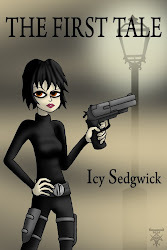 Edmund tucked the knife into his belt as he strode down the boardwalk. He forced himself to calm down, torn between indignation over the accusation and fear of the drunken gambler with the itchy trigger finger. He turned around. Blackjack Bud stood on the verandah of the saloon, blood dripping from his slashed cheek. Passersby dove for cover when he drew his Colt. Edmund cursed himself for not burying the knife in Blackjack Bud’s gun hand. Silence fell, as if the whole town took the same breath of anticipation. The seconds crashed by in Edmund’s head. He noticed an alley to his left, between the saloon and the hotel. Edmund stretched his hands up in surrender, glancing between Blackjack Bud and the alley. The crack of the pistol smashed the silence of the street. Edmund felt the impact as pain ripped into his gut. The force of the blow threw him backwards and a soundless scream tore itself from his throat. A fresh wave of pain rippled throughout his body when he hit the hard-packed earth of the street. The world turned dark. Edmund opened his eyes. He gazed up at a purple sky shot through with streaks of gold. Sunset. Why, only moments have passed! But why has no one come to my aid? he thought. The sound of hooves on dry ground passed him. He wriggled up onto his elbows to see a black horse pulling a stagecoach down the street. Edmund looked around, but the town seemed deserted. He looked back at the coach, but didn’t recognise the silver crest on the door. This visitor was far too grand for a dusty hole like Blackwood. The door swung open. A young woman poked her head out. Hair blacker than midnight tumbled around her white shoulders. Her black lips broke into a smile of grey teeth and purple gums. “Evening, friend. You look like you could use a ride somewhere?” she asked. Her cold voice buzzed like a thousand flies around a carcass. “Oh, indeed I could! I thought I had been shot but it appears I have had a miraculous escape,” said Edmund. He clambered to his feet and walked to the coach. His boots made no sound on the dirt. The young woman’s face fell. “I say, this is most decent of you. I shall be more than happy to reimburse you for your kindess,” said Edmund. He climbed into the coach. Up close, he realised that the young woman’s black eyes were filled with tiny stars. “Sweetie, you won’t ever need to pay for anything ever again,” she said. She closed the coach door. This is the first of a loose trilogy based around the Dead Man's Hand, the hand of cards allegedly held by infamous gunfighter Wild Bill Hickok when he was shot in the back while playing poker in a Deadwood saloon on August 2, 1876. Also, the mysterious mademoiselle in the black coach has appeared in my work before, in Fast Away The Old Year Passes, and New Year's Dance. *shiver* Don't know who the lady was but I don't think I'd want to go anywhere with her! :) Liked it very much, Icy. Purty good yarn there, podner! Blackjack Bud ain't an honorable man. I suspect there's a worse fate than Edmund's awaiting him. Awesome the way you tied the supernatural element to the western. Well done! I perked up at "saloon." Very little in the way of even vaguely Western #fridayflash. Jon Strother better come out and give it a look. Awesome awesome stuff. I love the way Edmund talks. This was hilarious, a real fun read "But this is poker" was a ROFLMA moment. I know exactly how Edmund feels sometimes. The fish out of water device beautifully twisted. The Edwardian gentleman straight from his Club in Gower Street, the hardened, gun-toting Westerner immediately recognisable from his Wanted poster. I thought you handled the dialogue well; there must have been a temptation to overdo the English gags but you held a tight rein. If I may critique one tiny area: the descriptive words in the saloon and final para were lovely, delectable, delicious - for the gunfight, I wonder, did they affect the pace a little? The concentration on detail during that scene was visual and if that was the intention then I withdraw the comment, but as a reader, I wanted to snap from look to look, from hand to gun to shot, to shock. Really punch your way through the action. Just a thought. But another superb piece! I do enjoy reading your Flash. Janet - She's my Lady Death. She pops up periodically when she gets bored. FAR - He's in my current novella, as it happens. Catherine - It's something I'm working on for a future project so thought I'd start now! 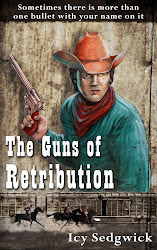 John - My WIP is a Western and I've been reading up on the Old West...it certainly grips the imagination. Raven - If there's only thing I love writing, it's Victorian English! Marc - Edmund felt the need to point out the obvious as Blackjack Bud isn't the sharpest tool in the box. Chris - Oh, I loved writing it! ibc4 - Thank you for the comments! I guess that's how I pictured it in my head so that's how I wrote it, but I could always take another look at it. I really enjoyed this one. Great humor early on before it all hit the fan. And it looks like his adventure is just beginning. Eyes filled with stars? I'll have to check out the other stories then! I say Edmund poses like a gentlemen, but he asked for what he got, cheating or not. Great story, Icy! Loved this Icy! Very interesting reading a Londoner's western where the cowboy has trouble understanding the king's English. :) Great dialog there, cool characters and ideas. As usual, staying tuned! I enjoyed the verbal wordplay between these two and then the fade into the supernatural was a nice ending; even if I was sad that he had to get shot. Excellent story. Perfect characters, setting and dialog. I can tell you really enjoyed writing this, because it shows in every line. And the mysterious lady in the end...shivers. Eric - I've found myself really enjoying writing Westerns of late, but yeah, I had to provoke a few wry smiles! Mari - He didn't actually cheat, but he is a bit smug. Harry - The dialogue was the most fun part to write! Aidan - I'm glad you liked it. Rachel - I love my mysterious lady. She pops up from time to time to remind me to do something with her. There was no way that tough gambler was going to accept losing to an overedumacated Enlish fop. Good dialogue and scene-setting Icy, and I love the ghostly ending. Nice. I love the description of her voice, too. Very creepy, indeed. I'm looking forward to seeing where this one leads. I loved the dialogue in this - all the way to Edmund cursing himself for not burying his knife in Blackjack's gun hand. Nice story to that point, and then the arrival of the midnight-haired young woman just kicked it up another notch. Great feel, Icy. The slash across the face was visceral. Smashing dialogue and even an Englishman is able to play a little dirty. Good to see Lady Death back in the action. I reckon she could be a graphic novel character, too. An excellent start to a trilogy, I'd say. Looking forward to the follow up stories. oooooooo, good story, Icy! I liked Edmond and was sad he was dead... until I realized the story was really just beginning. Yummy! Looking forward to it! Fantastic writing Icy. It flows so well and moves at a perfect pace. I too love the contrast between the modes of speech. Who is this mysterious woman and why does her face fall? Western to afterlife story in one shot. Marvellous. A) I'm desperately afraid of ever ending up with this hand in a game of poker. B) I love Edmund and how easily he offends. "I consider you a natural raconteur and easy wit." Love it! c) I love the lady in the death coach- so much imagery there- the millions of tiny stars in her eyes, the voice like a "thousand flies around a caracss". Really well done! I found myself trying to cheat and skipped to the end, but the horror of missing the best kept me faithful. How vivid and hooking. I saw Blackjack Bud's every expression and I felt when he was slashed on the face. Great job at taking me there. Black lips, grey teeth, star-eyes? Oh my God! I don't understand cards at all, but this hooked me right at the beginning. I can see why the Blackjack Bud would be offended with that kind of language! Edmund should have been careful when he saw the marks of a past brawl.